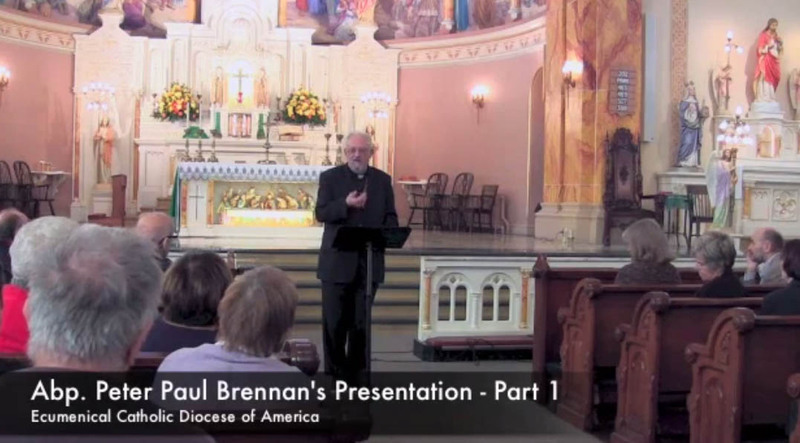 in St. Louis by Archbishop Peter Paul Brennan. (click below). We are an independent Catholic Diocese, a communion of local Church communities and ministries. We are committed to foundational Catholic teachings and beliefs. We are moving forward with the work begun by the Spirit at Vatican II toward being an inclusive and just Church. We welcome Christians of all traditions and all people of good will to join us in our service to others and our worship. "The Ecumenical Catholic Diocese of America was incorporated on March 25, 1982 under the New York State Article 10 of Incorporation. It is incorporated under the name THE EPISCOPATE OF THE ECUMENICAL CATHOLIC CHURCH and the document states that it is the diocese and the denomination of the Ecumenical Catholic Church. Article 10 is the same article under which the Roman Catholic Churches are incorporated. The incorporation is as a Church, a Religious Corporation and a Corporation Not-For-Profit. "We have used both The Ecumenical Catholic Diocese of America and The Ecumenical Catholic Diocese of the Americas as our name since that time. Rocco Corporale wrote an early vision of what the Ecumenical Diocese of America was meant to be which was published in the Federation of Christian Ministries Newsletter, Diaspora. An important change in the role of the diocese from the Roman Catholic hierarchical model is that the church is to be collaborative rather than hierarchial. The clergy and the laity are the administration of the church through synods and councils. The Ecumenical Catholic Diocese of America was established to maintain, propagate, practice and to perpetuate Catholic Religious worship, Catholic Sacraments, teaching and human services of the Christian Gospel and Ministry; and for carrying out this purpose to maintain a religious organization; said corporation is organized exclusively for charitable, religious, educational, and scientific purposes, including, for such purposes the making of distributions to organizations that qualify as exempt organizations. [Ed. Note] Rocco Carporale is one of the founding members of ECDA. In this article he presents an early vision for what ECDA could become. In it he outlines a program of activities and strategies of growth. He envisioned ECDA as an offshoot of the Federation of Christian Ministries (FCM). While the relationship did not unfold as he originally imagined it is interesting that all these years later ECDA is an organizational member of FCM. Caporale's entire article can be read by clicking here. "To help the church, historically many catholics had to place themselves beyond the purview of hierarchical control, although remaining within the catholic tradition. This is the basic reason for this proposal [to establish an ecumenical Catholic diocese]. "There appears to be a clear need, therefore, to establish an institutional alternative, a church-like organization, characterized by all the features of the institutional catholicism, but at the same time flexible enough to respond to the needs of the people, especially in the four areas considered above [Ecumenism,Sexual Equality, the pastoral imperative, and Marriage as a human institution]." "I envision a nation-wide, non-territorial church organization such as a diocese, to which priests, religious, disaffected catholics, congregations that are marginally involved with conventional church life, etc. could adhere and through which they could work out the solutions to the issues on which the conventional catholic church has little or no meaningful answers."